Recently we have had two pets brought in which had been tragically killed on the road. Had they been microchipped we would have been able to contact the owners immediately, however this was not the case. We highly recommend that all pet owners consider having their pet’s microchipped, it is relatively inexpensive and easy to do. The chip is implanted under the skin between the shoulders by means of a needle and syringe, just like an injection. Once this has been done, a form is completed with both the owners and pet’s details, this is faxed and posted to the company that manages the data base, in our case Identipet. All veterinary practices these days have hand held microchip scanners. 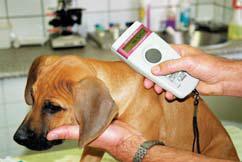 It is policy for all stray animals brought into the Alphen Veterinary Hospital to be scanned.